ordinary spectroscope bed, and the light from only one of the lines in the spectrum thus formed is allowed to pass through the slit d into the interferometer. As explained above, the light divides at the plate e, part going to the mirror/, which is movable, and part passing through to the mirror g. The first ray returns on the path fell. 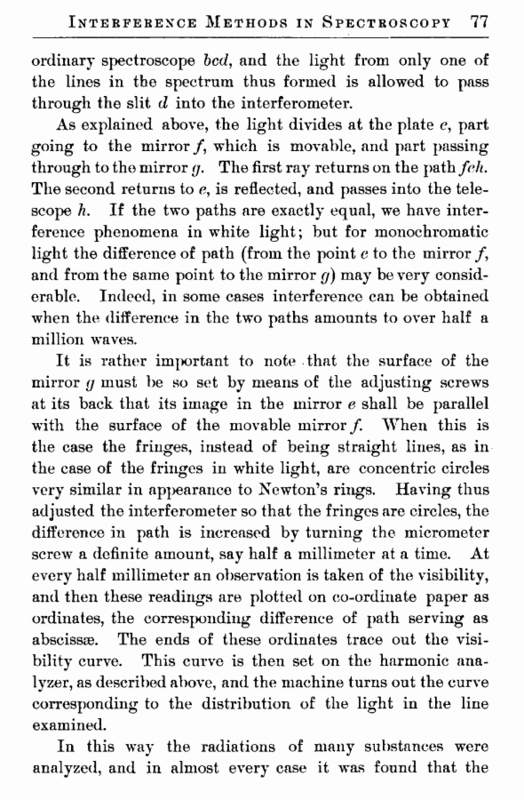 The second returns to e, is reflected, and passes into the telescope h. If the two paths are exactly equal, we have interference phenomena in white light; but for monochromatic light the difference of path (from the point e to the mirror /, and from the same point to the mirror g) may be very considerable. Indeed, in some cases interference can be obtained when the difference in the two paths amounts to over half a million waves. It is rather important to note that the surface of the mirror g must be so set by means of the adjusting screws at its back that its image in the mirror e shall be parallel with the surface of the movable mirror /. When this is the case the fringes, instead of being straight lines, as in the case of the fringes in white light, are concentric circles very similar in appearance to Newton’s rings. Having thus adjusted the interferometer so that the fringes are circles, the difference in path is increased by turning the micrometer screw a definite amount, say half a millimeter at a time. 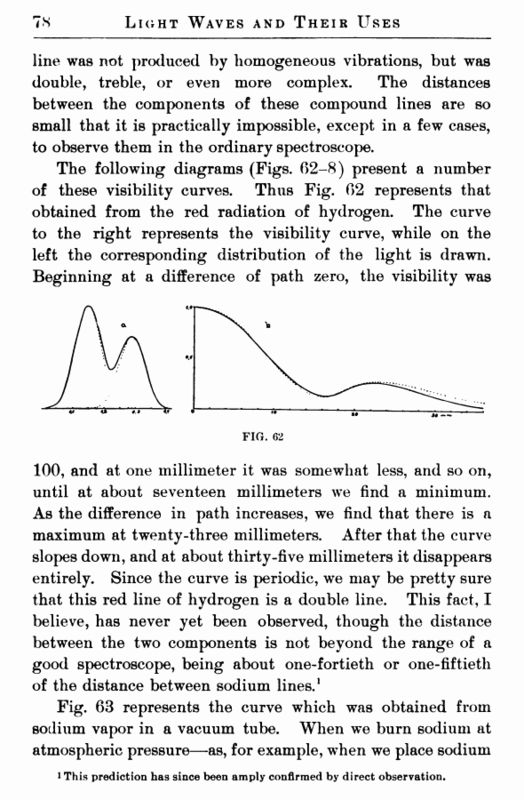 At every half millimeter an observation is taken of the visibility, and then these readings are plotted on co-ordinate paper as ordinates, the corresponding difference of path serving as abscissae. The ends of these ordinates trace out the visibility curve. This curve is then set on the harmonic analyzer, as described above, and the machine turns out the curve corresponding to the distribution of the light in the line examined. line was not produced by homogeneous vibrations, but was double, treble, or even more complex. The distances between the components of these compound lines are so small that it is practically impossible, except in a few cases, to observe them in the ordinary spectroscope. l This prediction has since been amply confirmed by direct observation.